The Thor HRG3080U offers plenty of cooking power in a standard gas range size. The exterior finish measures 30" wide, which is a mid-range kitchen opening. There are three grids to provide an even cooking surface across the top of the stove. The broiler is set at the top of the oven and this 4.2 cubic foot oven offers a quiet convection fan. Thor Kitchen headquarters are based in Chino, California. The stoves are assembled in China, but the parts are sourced from all over the world. The cooktop features four burners; one at 18,000 BTU, 1 and 15,000 BTU and 2 at 12,000 BTU. The burner pans are black gloss enamel and are well-sealed for easy clean-up. Should you have a spill, let the grates cool down, remove and wipe away. There are three grates available for use on this cooktop. The two outside grates must remain on the stove top so your pans have a spot to sit over the fire, but the center grate is optional. Depending on your need, you can leave this grate on to provide a flat surface for sliding pans around on the cooktop, or remove it to wipe up spills or have a spot for your stirring spoons and utensils. If the grates aren't placed properly, and lined up correctly, the flames will not ignite. The Thor HRG3080U features a 22,000 BTU convection oven with 4.2 cubic feet of baking and broiling capacity. The oven also features a cheerful and bright blue enamel finish. The oven window is wide and offers a great view of your baking project, and the halogen lights inside the oven give you the chance to monitor your meal as it bakes. If you love to bake, there are a few options or lack thereof that may be a deal breaker for you. No Digital Features: Because heat and electronics don't mix, the Thor HRG3080U doesn't offer a timer or clock; you'll need to invest in a free-standing unit. No Pre-Heating Notification: Because there are no digital sensors, you don't get a heads-up when the oven is fully pre-heated. You'll also need to purchase a thermometer. No Self-Cleaning Feature: Be prepared to scrub. This unit offers a quiet convection fan with plenty of air-moving power. If you're working on a soufflé, cake or quick bread, you can turn the convection feature off. While most oven racks slide on molded brackets formed into the oven wall, the racks in the Thor HRG3080U are mounted on a frame that protects the enamel coating inside your oven, so no scraping up the enamel finish. In addition to this protective frame, the racks inside the Thor HRG3080U can be adjusted to five different heights. This will allow you to broil close to the heat source at the top of the oven or use the lowest rack placement setting for a large dish such as a turkey, goose or ham. When changing out a gas stove, you need to have your new stove ready to install and you need a professional who knows how to hook up gas lines with no leaks. This is not a situation for a curious DIY-er. This stove also needs access to a 120 volt outlet. It should be noted that the plug on this stove will not allow the unit to sit flat against the wall; you might need to invest in a flat extension cord, just in case the clearance is a challenge. Again, a professional will be able to cater to your particular situation. 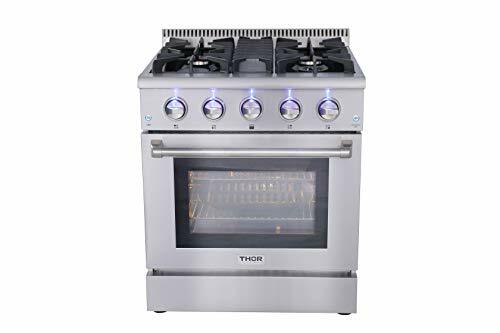 The Thor HRG3080U gas range may be most ideal for someone with a history in a professional kitchen who wants a professional-quality stove in 30" countertop gap. The heavy-duty cooktop grates and high-powered burners will help make your stove top cooking efficient by giving you heat when you need it. Cooking with a convection oven can be a joy once you figure it out. If you've never used one, connect with people who have one and see what they suggest.